Capsule Summary: Hawkeye is on the hook for $22,000 after Klinger’s goat eats a bag filled with military scrip. Meanwhile, Charles gets himself into trouble trying to buy a valuable vase. “That Darn Kid” is a sequel of sorts to “Payday” from Season 3, which saw Hawkeye serving as paymaster for the first time. In that episode, he was left with an extra $10 after paying everyone at the 4077th. While dealing with the paperwork to return the $10, he complained to Radar about all the money he was losing working for the Army rather than in civilian practice. Radar filled out a form and Hawkeye was paid $3,000, only for the Army demand the money back. In this episode, Hawkeye is again tasked with serving as paymaster and ends up owing the Army $22,340 after Klinger’s goat eats the scrip. It’s more than a little absurd and probably would have worked better during the first three seasons when M*A*S*H was at its wackiest. I haven’t had much experience with goats so I’m not sure how believable it is that the goat would chew through Klinger’s footlocker to get to the tasty bag of money inside. For once, it’s nice that nobody blamed Klinger for anything even though it was his goat and he was the one who put the money in the footlocker rather than ask Colonel Potter to open the safe. Hawkeye does yell at Klinger a little bit at first but that’s it. Klinger then helps Hawkeye and Colonel Potter blackmail Major Van Zandt. We never learn what happens to the goat nor do we see Klinger repaying Hawkeye and B.J. for the money they loaned him to buy the goat in the first place. Come to think of it, we never seen Klinger sell a single glass of goat milk. The Charles B story is a decent one, mostly because it ties into the A story pretty well. Poor Charles thought one elective course in Oriental Art made him an expert. He sure paid for that mistake. If I’m doing my math correctly, he ultimately has to pay Rizzo $250: one day of interest from his supplemental pay, three days of interest once he gets his regular pay, and the initial $50 loan. Rizzo’s role in this episode feels larger than Margaret, Father Mulcahy, and B.J. combined. B.J. has a bit to do at the start of the episode, loaning Klinger money and then trying to buy the vase from the farmer. He then basically disappears for the rest of the episode aside from a brief scene in surgery and the scene when he angrily throws everyone out of the Swamp. His anger is never explained. It’s also odd that B.J. isn’t involved in the scheme to save Hawkeye from having to repay the Army. “That Darn Kid” served as the Season 10 finale due to CBS holding back six episodes produced during Season 10 for use during Season 11. This was the second of two episodes directed by David Ogden Stiers. The first was “Identity Crisis” earlier in Season 10 (which was actually produced during Season 9). Radar and his love of Grape Nehi is mentioned by Igor and Charles actually drinks Grape Nehi, albeit in a brandy snifter. I think there’s a jarring cut during the opening scene. The farmer is wearing his hat when he pulls his cart in front of the Swamp and he is holding the cart handles with both hands. There’s a cut to a shot of the goat and then a cut to the farmer standing next to his cart without a hat. Good write up. Sometimes these Episode Spotlights can be a bit brief. But this one had a clear and concise plot summary, astute observations by the reviewer, and some original broadcast history. Well done. “Back Pay” appeared near the end of Season 8, not in Season 9. From what I have seen of Production Numbers, it was the last episode produced in Season 8, but “April Fools” originally aired 2 weeks after it. Somewhere I have a copy of the script of “April Fools”, and it has a completion date of [Tuesday] Jan. 8, 1980, which leads me to believe that its filming was complete by Friday, Jan .11, and then the other 2 episodes aired before it (and produced after in) in March, “War Co-Respondent” & “Back Pay” were filmed in the 2 weeks following, and Season 8 filming was complete by the end of January. As I commented on your Season 10 poll, this was about the silliest plot I ever recall seeing on this show. Maybe it would have fit better in the first 3 seasons, though I don’t see Frank going out of his way to buy a vase the way Charles did unless he thought it had money hidden in it. I’ve always wanted to dig into production schedules for the series but simply don’t have access to the necessary material to piece together when specific episodes were filmed. I’ve always assumed that the episodes were filmed in production order but your evidence suggests “Back Pay” (S625) was filmed before “April Fools” (S623) and “War Co-Respondent” (S624). Interesting. I never noticed it before but during the final scene, Charles glances at Igors vase right as Rizzo offers him another loan. Great look of defeat during the freeze frame. I didn’t really care for this episode, especially Rizzo acting like an overtly smarmy leech to Charles. A definite sign MASH was on its last legs. So is this the episode where there’s still an abundent supply of grape nehi in the Officer’s Club because Radar was the only one who drank the stuff and nobody else would touch it? This episode hinges on the fact that Hawkeye is believed to have stolen the money and claimed it was eaten by the goat. But what are the chances of a goat eating the entire $22000 worth of scrip and the bag it was in without leaving the slightest trace of either? One piece of remaining scrip or the chewed bag would prove Hawkeye’s innocence. This episode always reminds me of the episode of the Andy Griffith Show where a goat eats a stick of dynamite and everyone is terrified that the goat will explode. (Even as a ten year old I knew that was BS, the very act of chewing up the dynamite would render it harmless.) 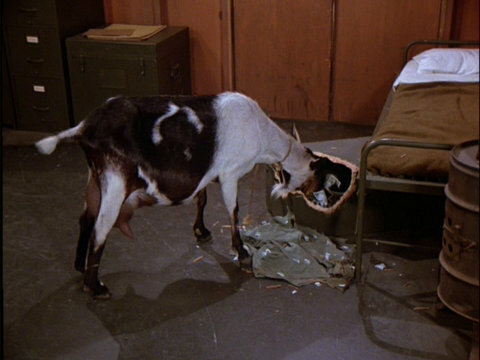 I wonder how many sitcoms over the years have used this hoary plot of a goat eating something. Thank you again for saying what I was thinking through the episode. Why is Hawkeye pleading with the camp for anyone to come forward that saw the goat eat the money? Both Klinger and Hawkeye saw him eating out of the bag. The chewed up bag should have been more than enough to clear him but like the ridiculous Klinger court martial story, the writers were desperate to make the show compelling so were forcing drama whenever they could. Not one of the best episodes. The story with the goat and the money is mildly entertaining, but the Major who came to investigate Pierce seems to have a huge chip on his soldier for no reason. The vase story is really annoying though and bothers me. Much like Klinger in Depressing News, seeing Rizzo act like this really makes me dislike his character. Unfortunately of all his few appearances throughout the series, this is the one I remember the most, which is too bad because he could be a likable character if not for this episode. Totally agree. Rizzo could be funny but he was just a scumbag in this one. It’s like they made him play the Zale role in the episode where he was just a swindler without care for anyone. I did wonder why Charles couldn’t just go cash a check himself somehow since he’s got money of his own. Maybe in Seoul? Usually one can tell an episode directed by one of the main actors,because that character is sent away or somehow else explained to be missing from scenes,however this is the exception that proves the rule because Charles seems to be in an average amount of screen time. I wonder if DOS took it as a challenge to direct an episode in which his character drove one of the subplots? I thought the same thing! He was a very driven man in real life so it seems like he didn’t take less work in any of the episodes he directed. I like him more for it. The most obvious solution would have been to immediately cut open the goat to retrieve the scrip, to have it as proof. They should have realised Hawkeye was in potential trouble even before inspector Van Zandt came. Also, why would Van Zandt be in such trouble for losing some papers? We all know that our beloved Charles is extremely knowledgeable and particularly eloquent (I think I just hurt my tongue! ), so how could he have made the following mistake? When he’s trying to buy off Rizzo with the vase, Rizzo asks “How stupid do you think I am?” to which Charles responds “An adjective fails me.” Call me crazy, but wouldn’t that actually be an adverb? An adjective modifies a noun, and correct me if I’m wrong, but “stupid” is an adjective. Just a tiny discrepancy that always bothers me.